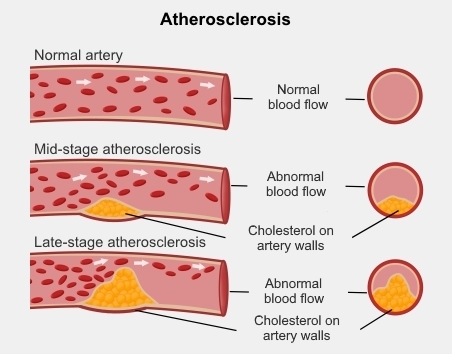 Atherosclerosis (a-ther-oh-scler-oh-sis) is a build-up of plaque on the inner lining of artery walls, which causes the artery to narrow. Plaque is made up of fats, cholesterol and other material. Narrowing of your arteries reduces the blood flow to your organs and other parts of your body. This means that less oxygen is delivered to those parts of your body. This is called coronary artery disease if it affects your heart, cerebrovascular disease if it affects your brain, and peripheral vascular disease (PVD) or peripheral artery disease (PAD) if it affects your arms or legs. We don’t know exactly what causes atherosclerosis. But smoking, high blood pressure, high cholesterol, diabetes, being overweight, and a family history of atherosclerosis increase your risk. What are possible complications of atherosclerosis? The complications depend on which arteries are affected. Atherosclerosis in your coronary arteries (the arteries that supply blood to your heart) can lead to angina or a heart attack. Atherosclerosis in your carotid arteries (the arteries that supply blood to your brain) can cause a transient ischaemic attack (TIA) or a stroke. Atherosclerosis in the arteries in your arms and legs (peripheral arteries) can cause peripheral vascular disease. Atherosclerosis in your renal arteries (the arteries that supply blood to your kidneys) can lead to chronic kidney disease. Your GP will ask you questions about your health, and about your family's health. Your symptoms will help them diagnose whether or not you have atherosclerosis. They'll also arrange blood tests to check your cholesterol and sugar levels. Your GP may also refer you to a vascular specialist (a surgical doctor who specialises in blood vessels). The vascular specialist might arrange tests like an echocardiogram and a CT scan. They might also arrange further tests like an ankle-brachial index (for peripheral vascular disease), a doppler ultrasound and an angiogram. For information about these tests, see Tests for blood vessel problems. Treatment options include reducing your risk factors, medication and surgery. atherectomy, where the surgeon uses a small cutting device to remove the plaque from inside your artery.